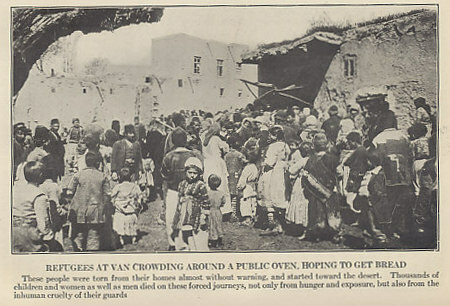 Refugees in Van, Armenian Turkey, crowding around a public oven in hopes of getting bread. Photograph from 'Ambassador Morgenthau's Story' by Henry Morgenthau, Formerly American Ambassador to Turkey from 1913 to 1916. The Ambassador made repeated attempts during 1915 to convince the rulers of Turkey, particularly Interior Minister Talaat and War Minister Enver, to spare the Armenian population. These people were torn from their homes almost without warning, and started into the desert. Thousands of children and women as well as men died on these forced journeys, not only from hunger and exposure, but also from the inhuman cruelty of their guards. 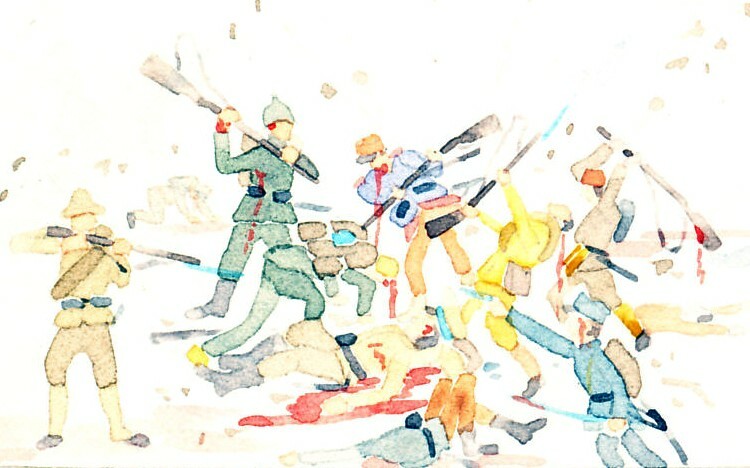 Although the Young Turks had promised equal rights for non-Turkish citizens, and had allowed them to serve in the army, by 1915 the revolution had turned against minority groups, particularly Armenians. Much of the population of the Russian/Turkish frontier was Armenian Christians. Turkish War Minister Enver Pasha put much of the blame for his disastrous defeat in the Battle of Sarikamish on the Armenians. With the defeat of the Anglo-French naval campaign in the Dardanelles, Enver and Minister of the Interior Talaat felt secure the Allies would not achieve their goal of seizing Constantinople and overthrowing the government. Across Turkey, they began a campaign to destroy the Armenian population. Beginning on April 15, 1915 in about 80 villages north of Van, young Armenian men were called out to hear an order of the Sultan, then marched outside the town and shot. In three days, 24,000 Armenians in the region were similarly murdered. On April 24, the campaign reached Constantinople where 761 men and women were arrested and exiled. Among them were the short story writer Grigor Zohrab (arrested May 20), the poet Daniel Varoužan (or Varujan, died August 26, 1915), and the poet Siamant'o. In his memoir on his years in Turkey, Henry Morgenthau, American Ambassador at Constantinople from 1913 to 1916 wrote extensively on the destruction of Turkey's Armenian citizens and his attempts to convince Enver and Talaat to relent. The two repeatedly refused. Although the government turned on Greeks, Jews, and other populations, the aim of extermination was directed only at the Armenians.